External cable for powering SAE Luggage Electrix™ Bulkheads. Low profile right angle plug for maximum clearance. Made with 18awg guage wire. 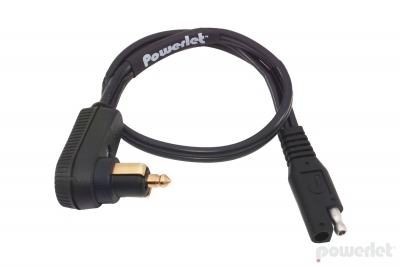 Can also be used to convert a battery charger or SAE heated clothing to a Powerlet® socket. Available 6" or 18" lengths. Most commonly used outside your luggage as part of the Luggage Electrix system, these cables were also designed with a 15 amp rating to power older heated clothing. Patented. Powerlet seeks the highest quality materials and craftsmanship. Our Luggage Electrix components are assembled and tested in the USA by people who like to ride. Quality components and attention to detail ensure Powerlet products resist wear and corrosion to last a lifetime. Powersport Standard Connectors are available in both a low profile plug and low profile socket. Often called "trailer connectors", these are used on Powerlet Luggage Electrix, Battery Tenders, Yuasa battery chargers and some heated clothing.